On Tuesday morning I was walking through the woods and came across another photographer. We struck up a conversation and he ended showing me, via the screen on his camera, photographs of a hawk he had stalked for the last few hours. His photographs were breathtakingly good. 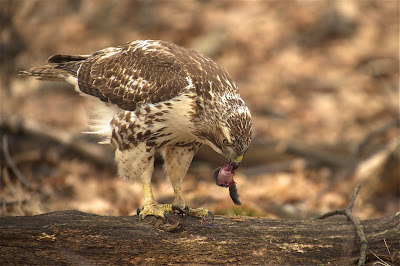 The light was marvelous, the hawk had a snake in its mouth and a little mouse. 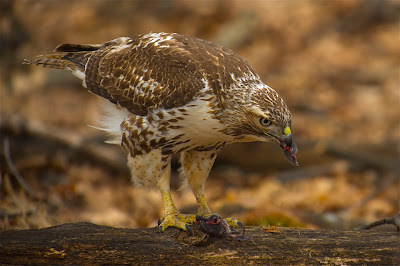 He said it was easy, just come early in the morning and don't give up until you find the hawk. Well, yesterday, I got up real early, left Ken and Yumiko to fend for themselves and stalked the hawk all morning. I saw him in the distance, but every time I got even close enough to set up my camera he flew to another part of the woods. I was disheartened, but thought, maybe another day. Today, I went back to the woods. For the first hour, nothing except a little chipmunk who was happy to pose. Then, as I was walking back to the parking lot, the hawk appeared. He looked right at me and basically said, "Come on, I'll show you where my breakfast is." 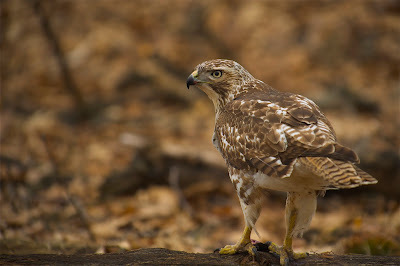 Then the hawk flew right passed me and landed on a fallen tree. I crept towards him, and he paid me no attention. Then he jumped off the log, on to the ground, and found a little mole. He brought his catch back up to the log and ate it in front of me. I got as close as I wanted to. He just showed off. Oh what a thrill it was. Here are some of the photos.